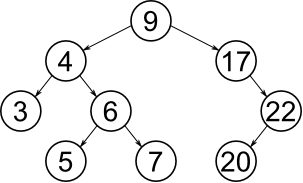 A binary search tree consists of nodes, where each node has zero, one or two siblings. The left sibling has a lower value and the right sibling has a higher value than the parent. Insert, delete and search operations all have the time complexity of O(log n). Insert given node into given binary tree. There can not be two or more nodes in the tree with the same key. This function returns -1 if a node with the same key is already in the binary tree. zero(0) on success, -1 if a node with the same key is already in the binary tree, otherwise negative error code. self_p: Binary tree to insert the node into. Delete given node from given binary tree. zero(0) on success, -1 if the node was not found, otherwise negative error code. self_p: Binary tree to delete the node from. key: Key of the node to delete. Search the binary tree for the node with given key. Pointer to found node or NULL if a node with given key was not found in the tree. self_p: Binary tree to search in. key: Key of the binary tree node to search for. self_p: Binary tree to print.